I was going through pictures on my computer and came across the two here from Christmas when we played a board game. I thought I'd go ahead and post the letter I wrote to Cam… Nobody else will care about Kevin' s bloody nose, but oh well. Hey Cam – Had a few moments so …. Highlights so far … Kevin had a bloody nose from hell this morning for almost two hours. He kept coughing or sneezing which would start his nose bleeding, and then the blood in his throat would cause him to cough and start it all over again. It's been pretty dry in Idaho, AND we got a wood stove, so that makes it even worse. He gets them sometimes, but I think this is the worst one so far. While he was bleeding and sitting still, Paige, Wendy, Tom & I went for an hour-long power walk. Good visiting & getting some fresh air. It was high 40s probably?? Felt pretty warm to me. When we got back we all showered up and then went to Swains. THEN… we made the BIGGEST STIR FRY EVER. Broccoli, cabbage, red pepper, yellow pepper, green pepper, white onion, green onion, celery, carrots, zucchini, mushrooms, bean sprouts, chicken. We had to be very strategic with the wokking. We did the chicken in two batches, then made a broccoli/carrot/chicken only batch for the picky vegie eaters, then put the rest together, but it didn't all fit in the wok so we had like 3 pans sitting around the kitchen in various stages. It all turned out good though. We blanched the broc & carrots first and coordinated the vegie cooking so that everything was actually crisp for the most part and not soggy. 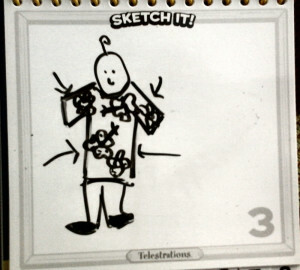 I even impressed myself …..
OK… THEN we played a game that we brought called Telestrations. It's like the telephone game. Everyone chooses a card. The card has a "this" side and a "that" side. A die is rolled. The number on the die corresponds to one of six words/things on the card. There are these little whiteboard spirals and you first write the WORD/thing on the card. Then you pass your spiral to the person on your left and they look at your word, and then try to draw a picture of it. Then they pass the spiral again and the next person tries to guess what the picture is and writes that word down, and so on so that you keep going until you get your own spiral back, and then you go through and show everyone the progression. Some are easy and some not so much. It was pretty funny. 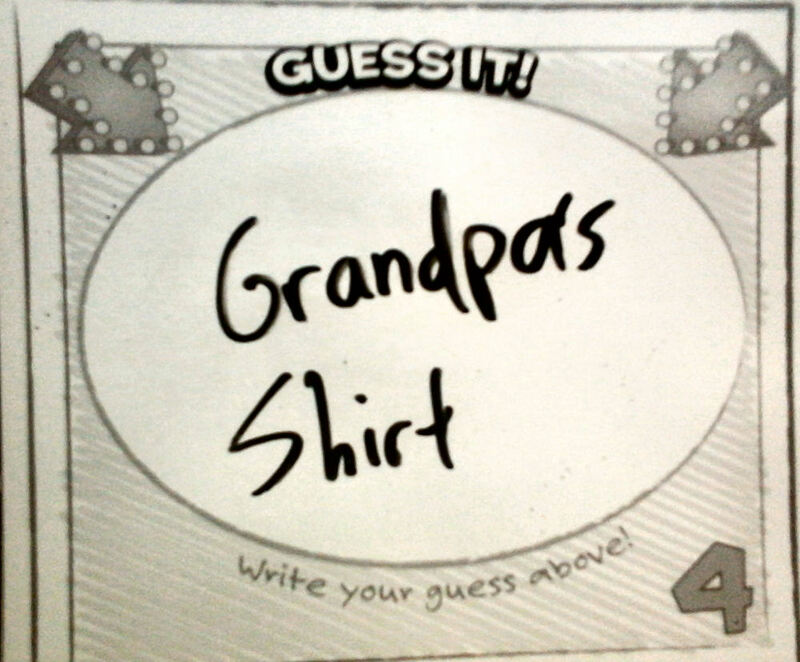 The funniest one today was when the word/thing was "hawaiian shirt." 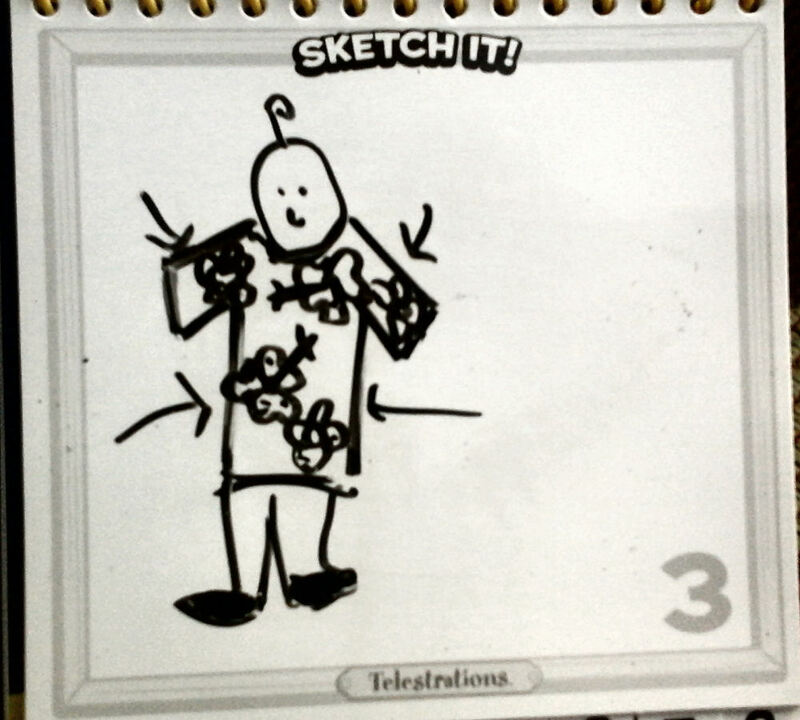 I can't remember where it started, but I drew a picture of a shirt, someone else guessed it, then Julia drew a picture of a person wearing a Hawaiian shirt and it looked EXACTLY LIKE DAD. 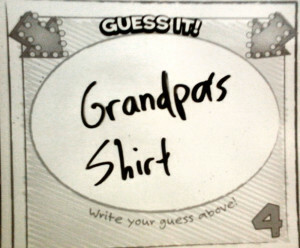 Maya was the person who had to guess what the picture was and she wrote "Grandpa's shirt." We of course all laughed hysterically. I have included pictures for your viewing pleasure. Anyway, it was pretty amusing. There really isn't score-keeping so much as it is just funny. That's about it for today. Erin & Julia are staying overnight. They're going to Brian's tomorrow evening, so they all wanted to spend tonight together. Love you guys!! It's weird without you. Glad you get to see Frankie in a few days!! Hope all the flights go smoothly.